At some point on summer break from school, all kids find themselves doing the same thing—lying around the house, complaining about being bored, and looking for something to do. And it isn’t long before they’re demanding rides around town and cash from their parents’ wallets.Get ahead of these problems by introducing your kids to the wonder of a summer job. With honest work on the agenda, they’ll keep boredom at bay and pocket some spending money. It’s a win for the whole family! 1. Lemonade stand. Kids will love this one because they get to run the show. They pick the business name, put the word out, serve the customers, and make the money! If your kiddo isn’t interested in lemonade, try selling shaved ice, brownies or another favorite treat. Be sure to guide them so they can learn what goes into running a business. And before you know it, your little entrepreneur will earn a big-time payday. 2. Assigned Chores. Time is money, right? Look around your home for chores that seem to eat up your time and don’t really need to be done by you. Offer to pay a commission for your kids to complete a chore or two on your behalf. They might vacuum, wash dishes, fold laundry, or any number of things! 3. Yard Sale. Encourage your kids to gather toys they no longer play with and clothes that no longer fit for a kid-produced yard sale. Guide them through preparing, advertising, and selling their stuff. Let them know that every dollar earned is theirs to keep! 6. Farmers Markets and Fairs. Do your kids love to bake or craft? They might just have what it takes to start a booming booth business at your local flea market or fair. A table full of freshly made treats or creative crafts are sure to draw a crowd! 7. Camp Counselor. Summer camp is full of opportunities to work with young kids, enjoy the great outdoors, and learn how to be a mentor. If that sounds interesting—and profitable—to your child, have them apply for counselor positions. 8. Neighborhood Dog Walker. This is a great idea if your son or daughter loves animals. Not only can they walk dogs and pile up savings, but they can also learn to provide great customer service in order to earn more clients and more money. 9. Cutting Grass and Lawn Care. People love the thought of a beautifully manicured lawn, but they may not like the idea of doing it themselves. Help your kids gain new business by teaching them how to market their services to the neighborhood. 10. Computer Support. Does your teen know their way around your technology gadgets and smart phone? If so, they’re the perfect fit for helping other adults take care of necessary electronic tasks. 11. Social Media Marketer. Encourage your daughter to put her time on Instagram to good use. Small businesses use social media to engage customers and increase brand awareness. For an hourly fee, your teen can take on the task of posting as well as responding to comments and questions. 12. Tutoring. If your teen excels in a particular subject, they might enjoy helping a younger kid or even a peer get caught up over the summer. And they’ll definitely enjoy the tutoring paycheck that comes with it! 13. Errand and Delivery Service. Lots of adults are getting in on this business idea, so why can’t your teen driver join them? Your teen might buy and delivery groceries for elderly neighbors or run errands for busy, working parents. 14. Lifeguard. The American Red Cross certifies lifeguards as young as age 15.² Teenagers can learn about safety and responsibility while soaking in the sun and being near the water. It’s not a bad gig for a summer job! 15. Restaurant Host. This position is great for teens who are outgoing and enjoy working with people. In addition to summertime money, teens will learn how to make a great first impression, which will be a great asset for future job interviews. 16. Grocery Store Employee. There are many different options for jobs within your local grocery store. Stocking shelves, ringing up orders, and bagging groceries are awesome ways for your kids to learn a good work ethic. This is also a great opportunity for them to develop people skills and learn to serve others. 17. Retail. This job shows your son or daughter the importance of presentation, customer service and attention to detail. Because this job requires organizing and tidying up store displays, it might appeal to someone who likes to put things in order. And who knows? Maybe after a couple months on the job, a few of those skills might translate to their chores around the house! Each of these jobs is a good opportunity to get your kid out of the house to earn extra money this summer! And as a bonus, they’ll learn valuable skills that will build their work ethic and their character. It’s never too early to learn the value of hard work and earning money! 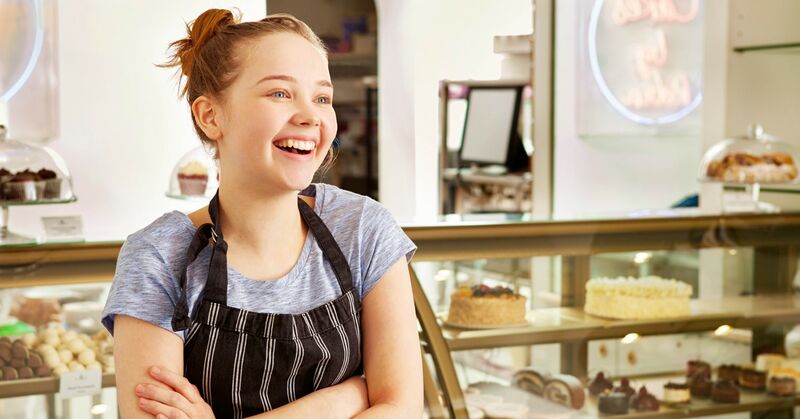 And for kids looking to start a business of their own, set them up for success with our new Teen Entrepreneur Tool Box. This all-inclusive kit is perfect for the young entrepreneur who wants to learn how to make money and succeed in the real world! Once your kids start making money, teach them how to give, save, and spend their cash by setting up a free budget in EveryDollar.